Installation: The front fork requires mounting holes to be installed. Front fender installation: 1. The expansion of the seat components with screws simply installed; 2. Moved the front fender connection and put the front fender plate. Rear fender installation: 1. The rear fender connecting rod with the installation clip connected: 2. The rear fender with the seat bar on the good fast fastening device. WHAT TYPE OF BIKE FOR IT? It is suitable for 26-29 inch mountain bike. Front fork hole diameter for 20.4-28MM between the bike, more than 28MM to be self-adhesive rubber or inner leather, or too much can not be stable and fixed. 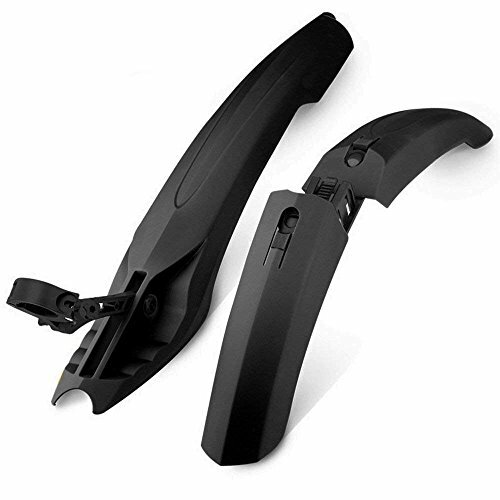 GOBIKE bicycle fender is widen and thicken,which have more securely wrap to prevent bike from heavy rain effectively. Reinforced buckle for fix to aviod shift and dislocation. ▶The front fender designed with two-piece mounting that is more robust against foreign objects,avoid dangerous damage. ▶The rear fender designed with widened tail and scientific arc, reduce the resistance at the same time effectively cover the mud splash. ▶Intimate taillight design for safer ride at night, provide more protection for rainy day and night. If you have any questions about this product by Gobike, contact us by completing and submitting the form below. If you are looking for a specif part number, please include it with your message.